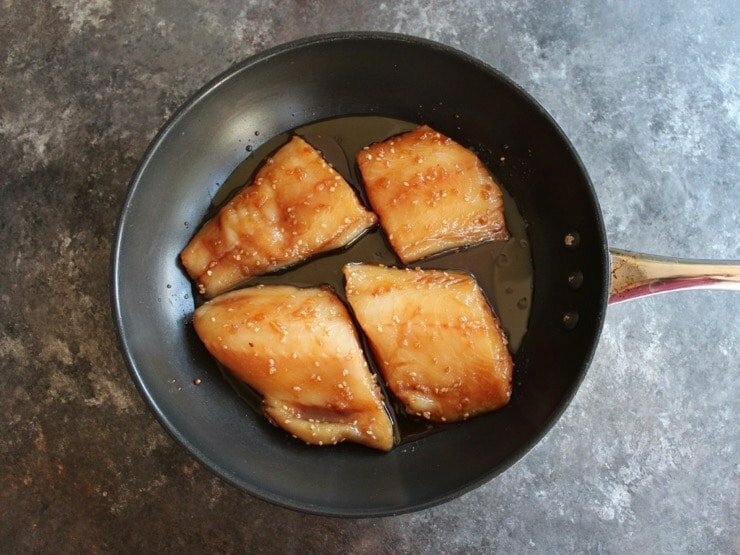 This Teriyaki Glazed Black Cod recipe will make you look like a rock star chef in the kitchen. 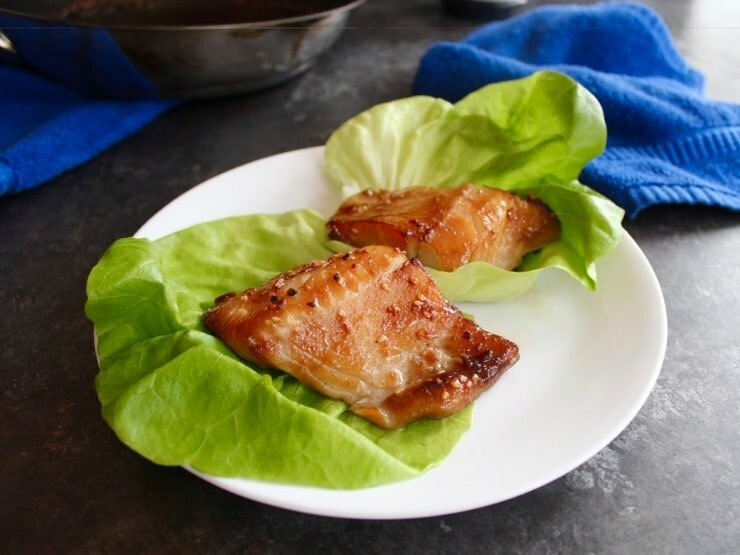 If you’ve ever tried miso black cod, this recipe is similar, but much easier to prepare. Marinating the fish in Soy Vay® Veri Veri Teriyaki® with a touch of cayenne infuses the flaky, buttery fish with flavor. Give it a quick bake-and-broil for a tender, buttery fish with a crisp glazed finish. Spring is here and I’m ready for some lighter recipes. I’ve partner with Soy Vay once again to bring you a tasty meal that’s so easy to make, yet has such a unique flavor, that I’m thinking of adding it to our monthly recipe rotation. 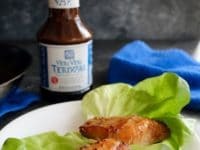 Soy Vay’s full line of kosher-certified sauces and marinades can be used on anything, from your favorite protein, to grains, vegetables, and even as a flavor booster for salad dressings. They contain no GMOs, no preservatives, and a few of their sauces are certified gluten free. These sauces are filled with flavor, which removes the added stress of making a recipe with lots of extra spices and ingredients. I love a brand with a good backstory, and Soy Vay’s is too adorable to leave out! The idea for the company began in 1980, when a Jewish boy and Chinese girl came together over their love of food and secret family recipes rooted in their cultural backgrounds. They found inspiration in classic Asian sauces, combined them with a kosher twist, and together founded Soy Vay in 1982. Today, Soy Vay is still passionate about unexpected pairings that can help you bring creative new dishes to your own kitchen. 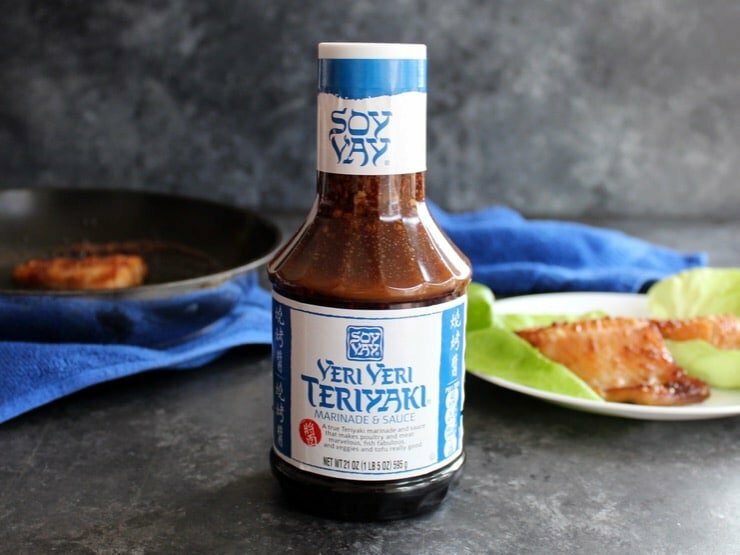 Soy Vay asked me to develop a light recipe for spring, and once again I was inspired by Soy Vay® Veri Veri Teriyaki®. The sauce is very flavorful on its own, which makes dinner prep that much easier. 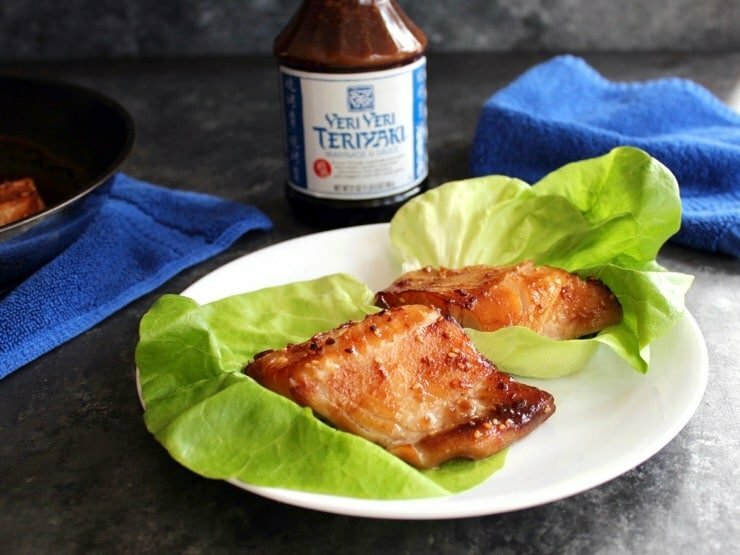 This recipe has only 4 ingredients – black cod fillets, Soy Vay® Veri Veri Teriyaki®, a pinch of cayenne, and olive oil for the skillet. 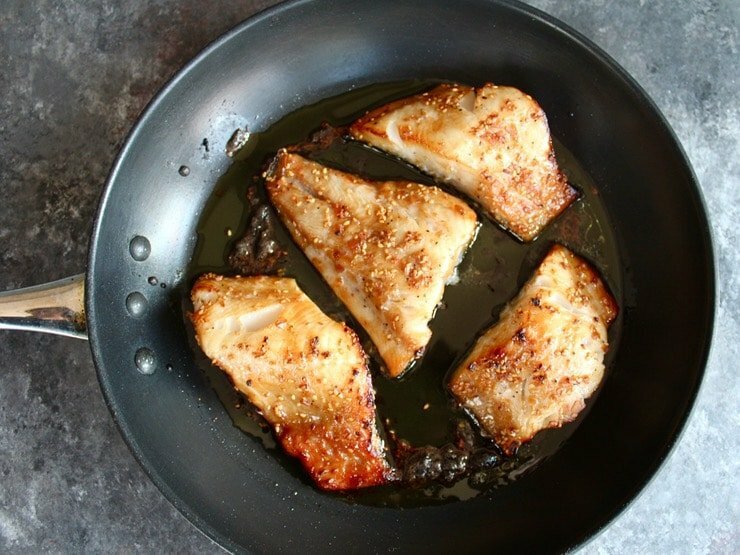 Black cod has a buttery and flaky texture that I just love. The resulting dish is reminiscent of a dish I order at one of my favorite restaurants, but it’s so much easier to make! Follow Soy Vay on Facebook, Pinterest, and Instagram. Thank you for supporting my sponsors, they allow me to share more free recipes, cooking tutorials, holiday crafts and food history with you! 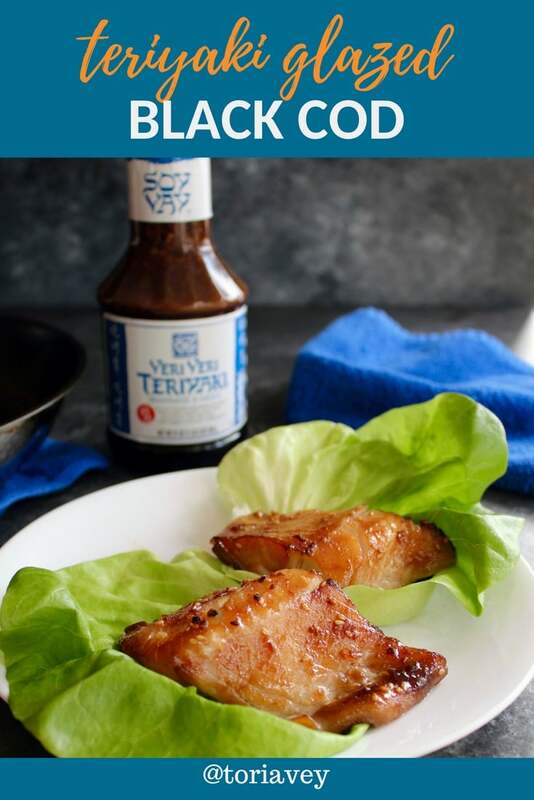 In this incredibly simple recipe, black cod fillets are marinated in Soy Vay Veri Veri Teriyaki sauce, then quick-roasted in a hot oven and broiled to caramelize. The result is a buttery, delectable fish entree. You will also need: Oven-safe nonstick skillet, 9x13 glass dish or plastic sealing bag for marinating. This recipe produces 4 standard portions, but it is very addicting— if you have heavier appetites, you might want to serve two fillets per person, which would make this a 2-serving recipe. The fish should marinate at least 6 hours, up to 24 hours. Longer marination will produce more flavorful results. Cod fillets sometimes contain a few small pin bones, which will rise up from the fillet during cooking. These can easily be plucked out after roasting and before serving. Please note that the sodium content relates to the entire amount of marinade, and does not reflect the sodium retained at the end of cooking after the excess marinade is discarded. 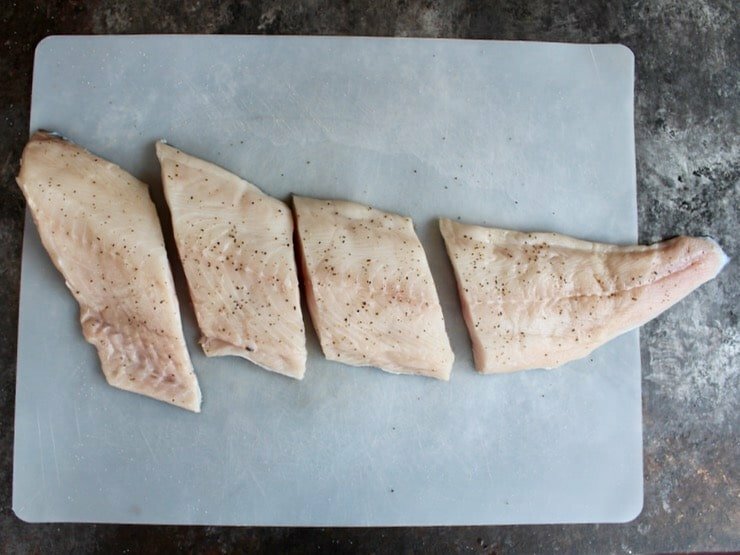 Slice your black cod fillets into 4 equal portions. Stir together your Soy Vay Veri Veri Teriyaki Sauce and Marinade together with 1/8 tsp cayenne pepper. 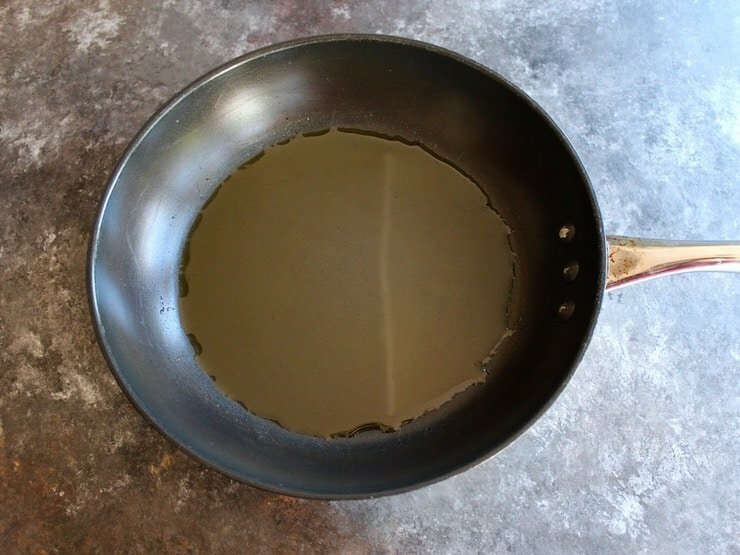 If using a dish to marinate, pour half of the marinade into the dish. Place the cod fillets flesh-side down into the marinade. Pour the remaining marinade over the top of the fish, brushing to coat all fillets evenly. Cover the dish with plastic wrap. 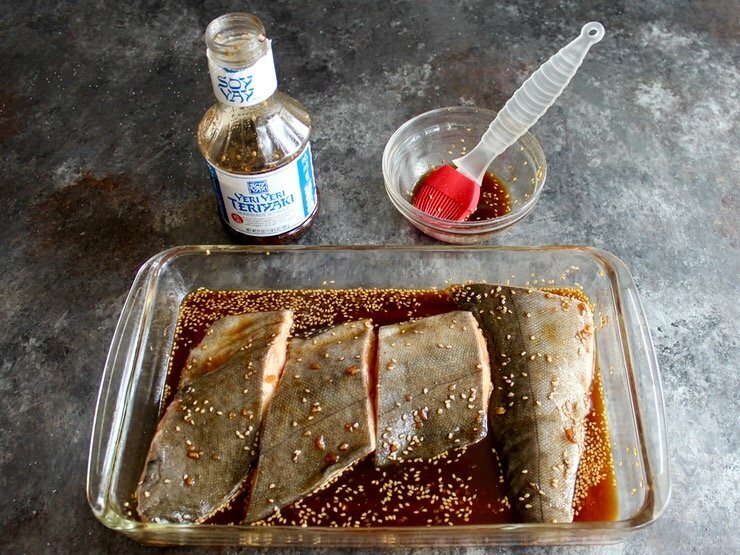 If using a sealed plastic bag to marinate, place the fish pieces into the bag and pour the marinade in. Remove most of the air from the bag and seal. Gently massage the fillets in the bag with the sauce, making sure that all of them are evenly coated. Place fish in the refrigerator for at least 6 hours, up to 24 hours. When ready to prepare, place a rack about 6 inches from you oven’s broiler element and preheat oven to 400 degrees F. Pour 2 tbsp of olive oil into an oven-safe nonstick skillet, brushing the bottom of the skillet to make sure it is fully coated with oil. Make sure your skillet has a metal handle; plastic handles will not tolerate the high oven heat. Take the marinated fish out of the refrigerator. Place the fillets skin-side down in your oiled skillet. Place fish in the oven and let it cook for 10-14 minutes until fish is cooked through, opaque white and flaky. Cook time will vary based on the thickness of your fillets. 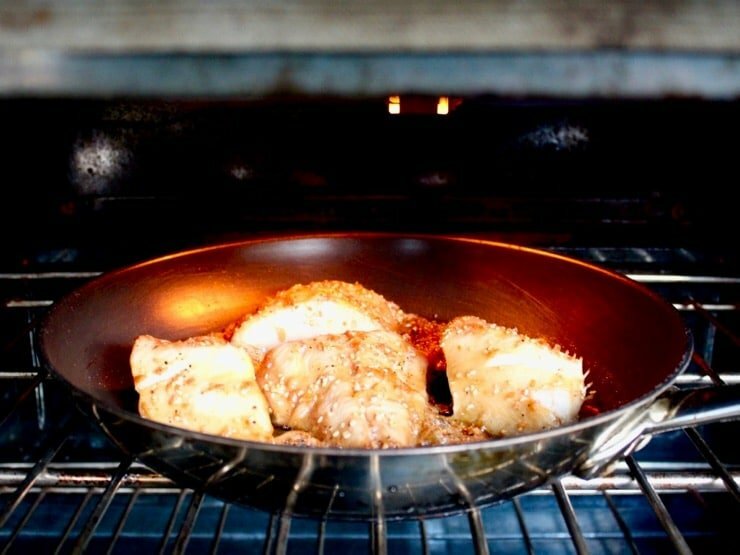 When fish is fully cooked, turn on your oven’s broiler. Let the fish continue to brown under the broiler for 1-2 minutes until the top of the fillets is caramelized. A small amount of blackening is desirable for flavor. Remove skillet from oven carefully— the handle will be extremely hot! Serve fillets immediately, hot from the oven. Enjoy! I don’t know how you did it, but you managed to make a near perfect copy of the Nobu miso black cod with way less expense, time and effort. Using Soy Vey sauce of all things! Color me impressed. This will be a regular in our house now. Can’t find black cod. Have you ever substituted another type of fish or just regular cod? Black cod is very fatty and moist; this preparation is really geared for it. Regular cod and other fish won’t make a good substitute here. As you search, you might also look for “sablefish” or “butterfish” – those are other names for black cod. Hope you can find it, good luck! Gayle, the sodium is related to the amount of marinade – most of the marinade is drained off of the fish before cooking, so the actual sodium is less than the stated nutrition facts. I am not sure of the exact sodium content, but it is far lower than what you see in the facts. Hi Meryl, you need something with a nonstick coating– if your broiler pan is nonstick, it will work great. The marinade becomes sticky and caramelized as it broils; a nonstick coating will help the delicate fish to release from the pan. You say skin side up in the directions but the pictures show skin side down. I’m assuming it’s the latter.